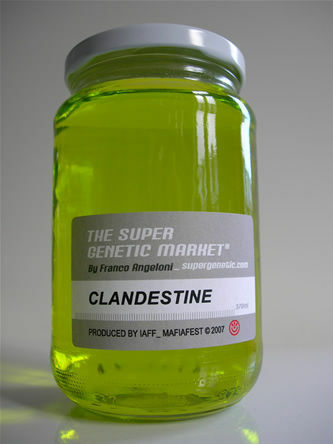 ‘The Super Genetic Market’ originated in the 90s from sensational news on cloning. With jars, the My Favorite Gene Jars, Franco Angeloni prompts a discussion in the art world on ideals and anomalies. Emotions, intellectual and political qualities, skills and functions are labeled as gene. From a broader perspective, this work of art evolves in parallel with discussions on diversity and the actual ‘hot topic’ from the eugenics within psychiatry and medicine in general. DAVID vzw invited in this spirit the patients of PZ Duffel to select a jar. Guided by Aifoon they created an auditory interpretation in the shape of a composition or soundscape, after going through exercises on sound observation. The result is an audiovisual installation, a sonorous view master, in which the outcomes of the workshops are viewable and listenable. copyright DAVID vzw, Trui Verhasselt bij de Sonore Viewmaster. Franco Angeloni (*1967, IT) studied art history in Rome and graphic design in Amsterdam. With radical choices originating from a communal involvement he dissects different contexts, including ecology, mobility and cultural diversity. His oeuvre is a mixture of drawings, paintings, installations and performances. In a minimalistic and conceptual idiom, Angeloni dissolves the border between life and the practicing of art. The PZ Duffel has a privileged relationship with artists and art professionals. It researches the connection between art and psychiatry and handles new methods in the image rendering function. The I AM HEARD workshop is a lever for being heard and relates to the vision of Christian Verschelden, psychologist in the PZ. According to him, at least three underlying therapeutic factors are thought to be active in art: art as a generator for discussion, art as boosting factor for recovery and art as ‘sublimation’.